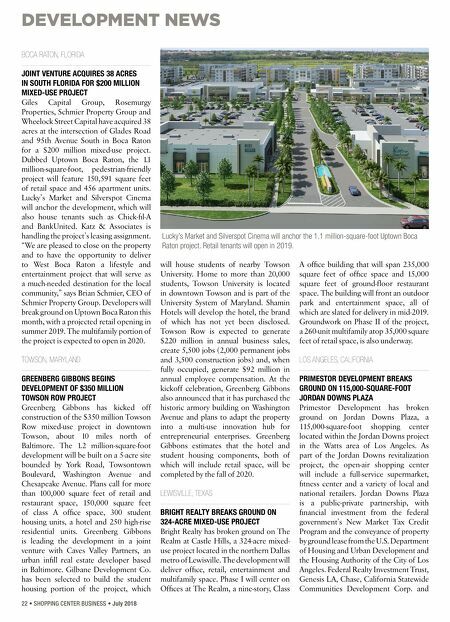 DEVELOPMENT NEWS 22 • SHOPPING CENTER BUSINESS • July 2018 BOCA RATON, FLORIDA JOINT VENTURE ACQUIRES 38 ACRES IN SOUTH FLORIDA FOR $200 MILLION MIXED-USE PROJECT Giles Capital Group, Rosemurgy Properties, Schmier Property Group and Wheelock Street Capital have acquired 38 acres at the intersection of Glades Road and 95th Avenue South in Boca Raton for a $200 million mixed-use project. Dubbed Uptown Boca Raton, the 1.1 million-square-foot, pedestrian-friendly project will feature 150,591 square feet of retail space and 456 apartment units. Lucky's Market and Silverspot Cinema will anchor the development, which will also house tenants such as Chick-fil-A and BankUnited. Katz & Associates is handling the project's leasing assignment. "We are pleased to close on the property and to have the opportunity to deliver to West Boca Raton a lifestyle and entertainment project that will serve as a much-needed destination for the local community," says Brian Schmier, CEO of Schmier Property Group. Developers will break ground on Uptown Boca Raton this month, with a projected retail opening in summer 2019. The multifamily portion of the project is expected to open in 2020. TOWSON, MARYLAND GREENBERG GIBBONS BEGINS DEVELOPMENT OF $350 MILLION TOWSON ROW PROJECT Greenberg Gibbons has kicked off construction of the $350 million Towson Row mixed-use project in downtown Towson, about 10 miles north of Baltimore. The 1.2 million-square-foot development will be built on a 5-acre site bounded by York Road, Towsontown Boulevard, Washington Avenue and Chesapeake Avenue. Plans call for more than 100,000 square feet of retail and restaurant space, 150,000 square feet of class A office space, 300 student housing units, a hotel and 250 high-rise residential units. Greenberg Gibbons is leading the development in a joint venture with Caves Valley Partners, an urban infill real estate developer based in Baltimore. Gilbane Development Co. has been selected to build the student housing portion of the project, which will house students of nearby Towson University. Home to more than 20,000 students, Towson University is located in downtown Towson and is part of the University System of Maryland. Shamin Hotels will develop the hotel, the brand of which has not yet been disclosed. Towson Row is expected to generate $220 million in annual business sales, create 5,500 jobs (2,000 permanent jobs and 3,500 construction jobs) and, when fully occupied, generate $92 million in annual employee compensation. At the kickoff celebration, Greenberg Gibbons also announced that it has purchased the historic armory building on Washington Avenue and plans to adapt the property into a multi-use innovation hub for entrepreneurial enterprises. Greenberg Gibbons estimates that the hotel and student housing components, both of which will include retail space, will be completed by the fall of 2020. LEWISVILLE, TEXAS BRIGHT REALTY BREAKS GROUND ON 324-ACRE MIXED-USE PROJECT Bright Realty has broken ground on The Realm at Castle Hills, a 324-acre mixed- use project located in the northern Dallas metro of Lewisville. The development will deliver office, retail, entertainment and multifamily space. Phase I will center on Offices at The Realm, a nine-story, Class A office building that will span 235,000 square feet of office space and 15,000 square feet of ground-floor restaurant space. The building will front an outdoor park and entertainment space, all of which are slated for delivery in mid-2019. Groundwork on Phase II of the project, a 260-unit multifamily atop 35,000 square feet of retail space, is also underway. LOS ANGELES, CALIFORNIA PRIMESTOR DEVELOPMENT BREAKS GROUND ON 115,000-SQUARE-FOOT JORDAN DOWNS PLAZA Primestor Development has broken ground on Jordan Downs Plaza, a 115,000-square-foot shopping center located within the Jordan Downs project in the Watts area of Los Angeles. As part of the Jordan Downs revitalization project, the open-air shopping center will include a full-service supermarket, fitness center and a variety of local and national retailers. Jordan Downs Plaza is a public-private partnership, with financial investment from the federal government's New Market Tax Credit Program and the conveyance of property by ground lease from the U.S. Department of Housing and Urban Development and the Housing Authority of the City of Los Angeles. Federal Realty Investment Trust, Genesis LA, Chase, California Statewide Communities Development Corp. and Lucky's Market and Silverspot Cinema will anchor the 1.1 million-square-foot Uptown Boca Raton project. 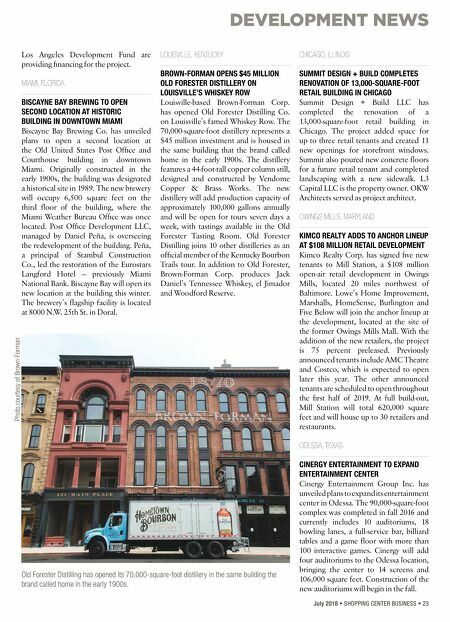 Retail tenants will open in 2019.